Let me just cut through the fat and get right to the point regarding the book Serious Barbecue by Adam Perry Lang. Get it, read it and use it! This is, if not the best, certainly one of the best barbecue and grilling books I have ever read. This isn't really all that surprising, given that it's written by a CIA-trained chef-turned-BBQ-guy. Adding to Adam's long list of credentials and accolades, his pork shoulder took first place at the prestigious American Royal Invitational BBQ competition (a.k.a. "The World Series of BBQ"). He also owns Daisy May’s BBQ U.S.A. in New York City, which was named "the Height of Pit Cuisine" by Food & Wine Magazine. So, this guy has serious barbecue and grilling chops! One of the complaints that I have read about this book is that Adam's recipes are "too complicated" and that they use "too many fancy ingredients". I disagree with those sentiments and prefer to look at it differently. This is a cookbook that will push the bounds of your typical backyard live-fire cooking. The techniques and layering of flavors will push you out of your comfort zone, and the beautiful photographs make you want to try the recipes. I could go on and on about how good this book is, but the "Smoke, Char, Baste, and Brush Your Way to Great Outdoor Cooking" subtitle really sums it up nicely. 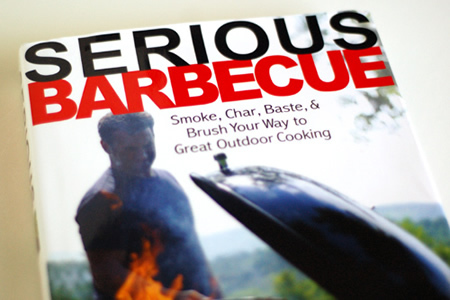 If you want to expand your horizons and learn to take your barbecue and grilling to new heights, get this book.